Summer Vacation, and it’s so much better with friends. The whole idea of doing things with her friends has Botan literally spinning, but we know how Botan doing anything movement-oriented will turn out. But summer beckons, with almost-free karaoke thanks to Ren. It’s quite the mix of experience they have in the group, besides the self-proclaimed Hibiki, Master of Karaoke. Botan and Hibari have never gone, and Hanako has never actually sung, since she always gets feedback whenever she touches the mic. But it’s a good time to get a little in-show promotion of character songs, and also the catchy song that will dominate the rest of the episode… Ti-Ti-Timo Timo. And for a fun little touch they put in the show, when Timothy was telling the girls that he was going to have scheduled maintenance over the summer break, her was talking into the mic and they put just a little reverb on his voice. Another detail that just make this show fun to watch. Are you ready to rap? They had another interesting touch with the sound of the cicadas, which were people obnoxiously voicing them. I don’t know if I’ve seen a show do a better job in conveying the annoyance of the sound of cicadas, something I’m very familiar with living in the middle of the Brood X Magicicada range (5 more years until they’re back). 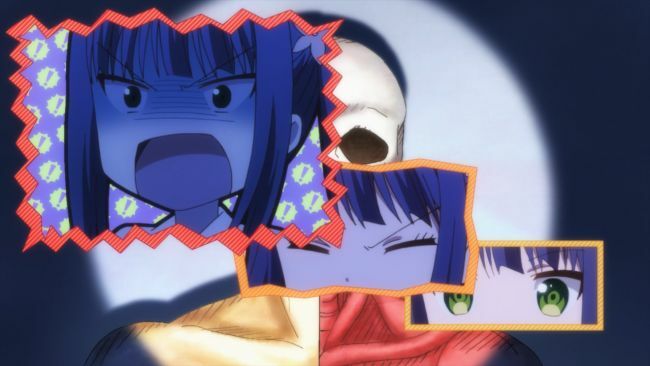 Another annoying thing is when you get a song stuck in your head, like the Ti-Ti-Timo Timo song, and I think we see a little more of Hanako’s personality when she’s “helping” Hibari try to get the Ti-Ti-Timo Timo song out of her head… by suggesting TV jingles that are just as earwormy. But that takes a backseat when the blonde twintails girl shows up. You know, the one in the OP who finally turned around this episode. 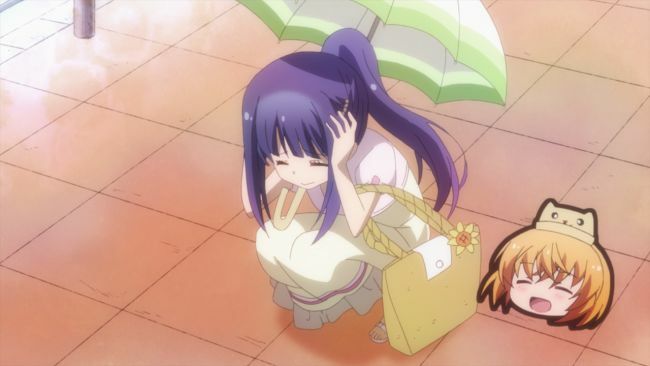 But all she does right now is knock Hibari’s parasol away and then run away, leaving Hanako and Hibari to continue to Botan’s beach dome. 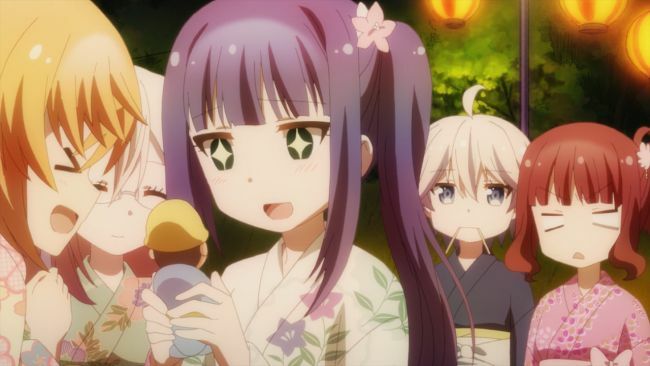 It’s also time for the summer festival, and the five girls all go together, meeting up fairly early because Hanako only fell in the river one time. 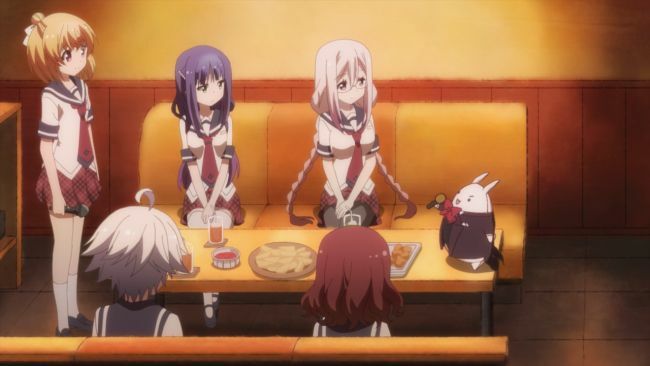 They do normal festival things, eating food (I’m surprised that Hanako didn’t have the takoyaki toothpick break like all the other “on-a-stick” things she bought), winning prizes (like a little figure of Hibari’s koibito, why would they even make a figure like that? ), and getting separated. It wasn’t hard to figure out they’d get separated, since they said they’d meet up at the school if they did. I’m kind of surprised that they met at the school, since it seems so far away from everything, but it sets up the final bit of the show. 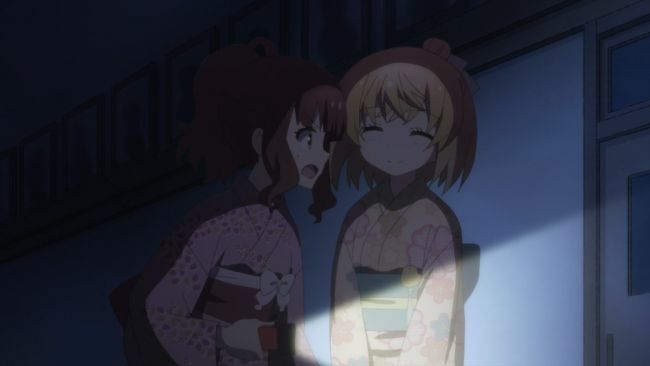 I think that they gave an answer to the question posed in the second episode when Hanako gets a bit of fun out of teasing Hibiki about being scared about being in the school after dark. I had thought that her hearing test was winding up Hibari and Botan, and I think her grin at leading Hibiki around to scare her is confirmation that she likes to make practical jokes about scary things. Ren and Botan do their part to wind up Hibari as well, but the really scary thing is the return of the Ti-Ti-Timo Timo song… sung by the disembodied parts of Timothy. Not only that, but his lower half starts chasing them, so of course they run away, hounded by the song and Ren’s maybe-not-so-faithful retelling of scary legends. 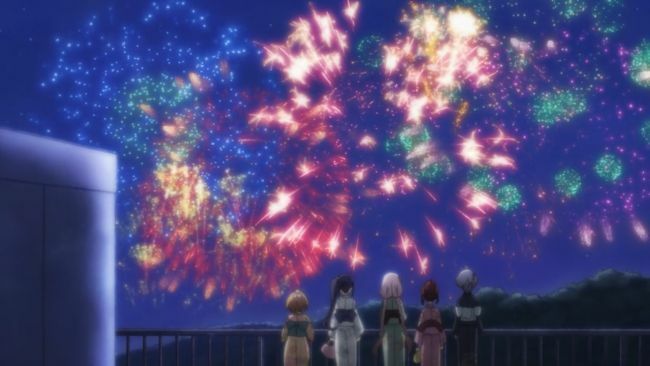 But eventually they end up on the roof, just in time for the fireworks show, rendered even more beautiful by their height and distance from the show. It’s a fitting entry into Botan’s lyrical retelling of her summer memories. So I complained a couple days ago about the introduction of Chisame to Bakuon! !, in that she seemed to take over the show. Anne Happy took a much different route to introduce a new character, if you can even call her ‘introduced’ at this point. I think we’ve all been waiting for the blonde twintail girl to show up, and now that she has, we want to find out what she’s doing, since she seems to be an enigma, working on Timothy so maybe she’s a genius of some sort. 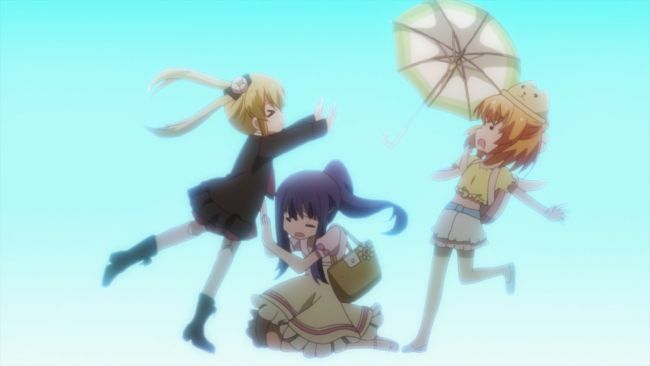 Will we find out why she pushed Hibari’s umbrella away? Will she become friends with our group of girls? Perhaps she’ll even be their link to the ‘normal’ classes at Tennomifune Academy? A lot of possibilities, but like everything else in the show, I like the way that Shin Oonuma is going about it. Hmm, maybe she’s in a special class of special bad luck. People just don’t “trip into hello” for no good reason after all. 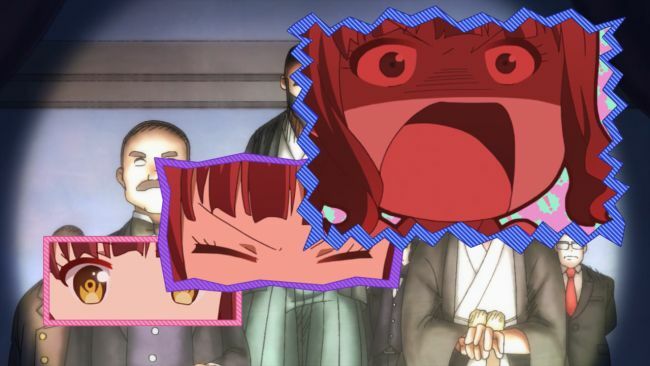 This is anime. I think she’s one better: Timothy’s inventor. And I wonder if she feels like she’s closer to the girls than they know because she’s been watching via Timothy since the beginning of the school year. 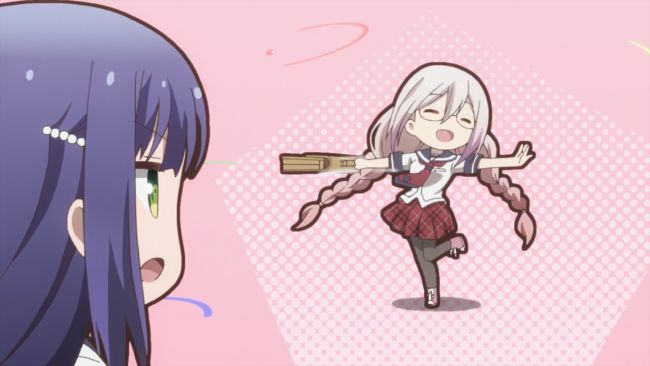 She could have programmed Timothy’s “always escapes from Hanako” technique…a skill she herself has?